The right brachial plexus with its short branches, viewed from in front. The brachial plexus is a network of nerves formed by the ventral rami of the lower four cervical nerves and first thoracic nerve (C5, C6, C7, C8, and T1). This plexus extends from the spinal cord, through the cervicoaxillary canal in the neck, over the first rib, and into the armpit. It supplies afferent and efferent nerve fibers to the chest, shoulder, arm and hand. A plexus is a branching network of the vessels or nerves. The vessels may be blood vessels or lymphatic vessels. The nerves are typically axons outside the central nervous system. The cervical spinal nerve 5 (C5) is a spinal nerve of the cervical segment. The cervical spinal nerve 6 (C6) is a spinal nerve of the cervical segment. The brachial plexus is divided into five roots, three trunks, six divisions (three anterior and three posterior), three cords, and five branches. There are five "terminal" branches and numerous other "pre-terminal" or "collateral" branches, such as the subscapular nerve, the thoracodorsal nerve, and the long thoracic nerve,  that leave the plexus at various points along its length. A common structure used to identify part of the brachial plexus in cadaver dissections is the M or W shape made by the musculocutaneous nerve, lateral cord, median nerve, medial cord, and ulnar nerve. The musculocutaneous nerve arises from the lateral cord of the brachial plexus, opposite the lower border of the pectoralis major, its fibers being derived from C5, C6 and C7. The median nerve is a nerve in humans and other animals in the upper limb. 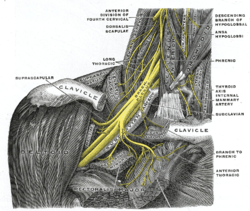 It is one of the five main nerves originating from the brachial plexus. In human anatomy, the ulnar nerve is a nerve that runs near the ulna bone. The ulnar collateral ligament of elbow joint is in relation with the ulnar nerve. The nerve is the largest unprotected nerve in the human body, so injury is common. This nerve is directly connected to the little finger, and the adjacent half of the ring finger, innervating the palmar aspect of these fingers, including both front and back of the tips, perhaps as far back as the fingernail beds. The five roots are the five anterior rami of the spinal nerves, after they have given off their segmental supply to the muscles of the neck. The brachial plexus emerges at five different levels; C5, C6, C7, C8, and T1. C5 and C6 merge to establish the upper trunk, C7 continuously forms the middle trunk, and C8 and T1 merge to establish the lower trunk. Prefixed or postfixed formations in some cases involve C4 or T2, respectively. The dorsal scapular nerve comes from the superior trunk  and innervates the rhomboid muscles which retract the scapula. The subclavian nerve originates in both C5 and C6 and innervates the subclavius, a muscle that involves lifting the first ribs during respiration. The long thoracic nerve arises from C5, C6, and C7. This nerve innervates the serratus anterior, which draws the scapula laterally and is the prime mover in all forward-reaching and pushing actions. A spinal nerve is a mixed nerve, which carries motor, sensory, and autonomic signals between the spinal cord and the body. In the human body there are 31 pairs of spinal nerves, one on each side of the vertebral column. These are grouped into the corresponding cervical, thoracic, lumbar, sacral and coccygeal regions of the spine. There are eight pairs of cervical nerves, twelve pairs of thoracic nerves, five pairs of lumbar nerves, five pairs of sacral nerves, and one pair of coccygeal nerves. The spinal nerves are part of the peripheral nervous system. The neck is the part of the body, on many vertebrates, that separates the head from the torso. It contains blood vessels and nerves that supply structures in the head to the body. These in humans include part of the esophagus, the larynx, trachea, and thyroid gland, major blood vessels including the carotid arteries and jugular veins, and the top part of the spinal cord. The upper trunk is a trunk of the brachial plexus which derives from the C5 and C6 roots. The cervical spinal nerve 7 (C7) is a spinal nerve of the cervical segment. The cervical spinal nerve 8 (C8) is a spinal nerve of the cervical segment. These six divisions regroup to become the three cords or large fiber bundles. The cords are named by their position with respect to the axillary artery. In human anatomy, the axillary artery is a large blood vessel that conveys oxygenated blood to the lateral aspect of the thorax, the axilla (armpit) and the upper limb. Its origin is at the lateral margin of the first rib, before which it is called the subclavian artery. The posterior cord is a part of the brachial plexus. It consists of contributions from all of the roots of the brachial plexus. The lateral cord is a division of the brachial plexus. Cervical spinal nerves C5, C6, and C7 contribute to it. The medial cord is a division of the brachial plexus. Anatomical illustration of the brachial plexus with areas of roots, trunks, divisions and cords marked. Clicking on names of branches will link to their Wikipedia entry. Diagrammatic representation of the brachial plexus using colour to illustrate the contributions of each nerve root to the branches. 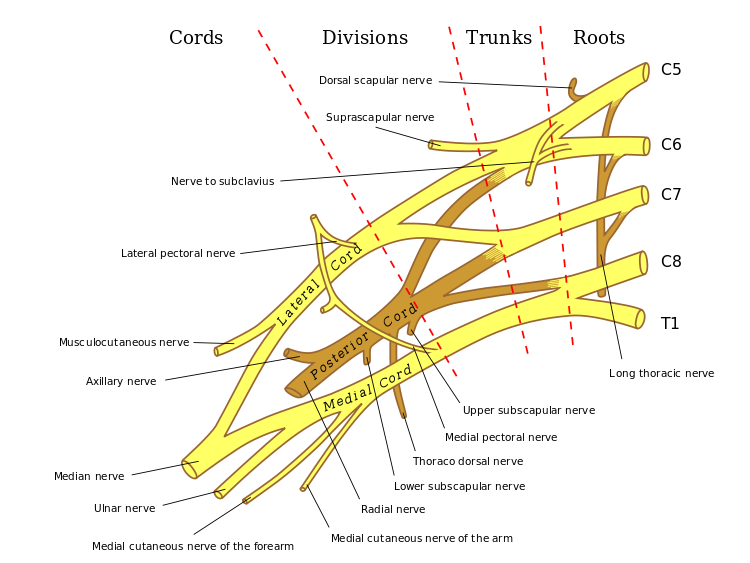 The brachial plexus, including all branches of the C5-T1 ventral primary rami. Includes mnemonics for learning the plexus's connections and branches. Bold indicates primary spinal root component of nerve. Italics indicate spinal roots that frequently, but not always, contribute to the nerve. posterior cord radial nerve C5, C6, C7, C8, T1 triceps brachii, supinator, anconeus, the extensor muscles of the forearm, and brachioradialis skin of the posterior arm as the posterior cutaneous nerve of the arm. Also superficial branch of radial nerve supplies back of the hand, including the web of skin between the thumb and index finger. The brachial plexus is responsible for cutaneous and muscular innervation of the entire upper limb, with two exceptions: the trapezius muscle innervated by the spinal accessory nerve (CN XI) and an area of skin near the axilla innervated by the intercostobrachial nerve. The brachial plexus communicates through the sympathetic trunk via gray rami communicantes that join the plexus roots. To differentiate between pre ganglionic and post ganglionic injury, clinical examination requires that the physician keep the following points in mind. Pre ganglionic injuries cause loss of sensation above the level of the clavicle, pain in an otherwise insensate hand, ipsilateral Horner's syndrome, and loss of function of muscles supplied by branches arising directly from roots—i.e., long thoracic nerve palsy leading to winging of scapula and elevation of ipsilateral diaphragm due to phrenic nerve palsy. Acute brachial plexus neuritis is a neurological disorder that is characterized by the onset of severe pain in the shoulder region. Additionally, the compression of cords can cause pain radiating down the arm, numbness, paresthesia, erythema, and weakness of the hands. This kind of injury is common for people who have prolonged hyperabduction of the arm when they are performing tasks above their head. Brachial plexus injuries are injuries that affect the nerves that carry signals from the spine to the shoulder. This can be caused by the shoulder being pushed down and the head being pulled up, which stretches or tears the nerves. Injuries associated with malpositioning commonly affect the brachial plexus nerves, rather than other peripheral nerve groups. Due to the brachial plexus nerves being very sensitive to position, there are very limited ways of preventing such injuries. The most common victims of brachial plexus injuries consist of victims of motor vehicle accidents and newborns. Many of these patients were forced to undergo reconstructive surgery. During physical therapy, the position of the brachial plexus became very important to avoid further damage. "The risk can be reduced by thorough release of the tissues from the inferior surface of the clavicle before mobilization of the fracture fragments." By wearing protective gear, like a helmet, a motorcyclist can help prevent nerve damage after collisions. In this photo, the subject performs an example of a motorcyclist colliding with the floor at an angle, which may damage the brachial plexus nerves. The photo shows how head and shoulder are extremely separated, which may stretch or even tear the nerves in the between area. Protective gear can help prevent nerve damage by providing extra support on the opposite side of the head to prevent over-stretching the neck. One sports injury that is becoming prevalent in contact sports, particularly in the sport of American football, is called a "stinger." An athlete can incur this injury in a collision that can cause cervical axial compression, flexion, or extension of nerve roots or terminal branches of the brachial plexus. In a study conducted on football players at United States Military Academy, researchers found that the most common mechanism of injury is, "the compression of the fixed brachial plexus between the shoulder pad and the superior medial scapula when the pad is pushed into the area of Erb's point, where the brachial plexus is most superficial.". The result of this is a "burning" or "stinging" pain that radiates from the region of the neck to the fingertips. Although this injury causes only a temporary sensation, in some cases it can cause chronic symptoms. Most penetration wounds require immediate treatment and are not as easy to repair. For example, a deep knife wound to the brachial plexus could damage and/or sever the nerve. According to where the cut was made, it could inhibit action potentials needed to innervate that nerve's specific muscle or muscles. Brachial Plexus injuries can occur during the delivery of newborns when after the delivery of the head, the anterior shoulder of the infant cannot pass below the pubic symphysis without manipulation. This manipulation can cause the baby's shoulder to stretch, which can damage the brachial plexus to varying degrees. This type of injury is referred to as shoulder dystocia. Shoulder dystocia can cause obstetric brachial plexus palsy (OBPP), which is the actual injury to the brachial plexus. The incidence of OBPP in the United States is 1.5 per 1000 births, while it is lower in the United Kingdom and the Republic of Ireland (0.42 per 1000 births). While there are no known risk factors for OBPP, if a newborn does have shoulder dystocia it increases their risk for OBPP 100-fold. Nerve damage has been connected to birth weight with larger newborns being more susceptible to the injury but it also has to do with the delivery methods. Although very hard to prevent during live birth, doctors must be able to deliver a newborn with precise and gentle movements to decrease chances of injuring the child. Tumors that may occur in the brachial plexus are schwannomas, neurofibromas and malignant peripheral nerve sheath tumors. Imaging of the Brachial Plexus can be done effectively by using a higher magnetic strength MRI Scanner like 1.5 T or more. It is impossible to evaluate the brachial plexuses with plain Xray, CT and ultrasound scanning can manage to view the plexuses to an extent; hence MRI is preferred in imaging brachial plexus over other imaging modalities due to its multiplanar capability and the tissue contrast difference between brachial plexus and adjacent vessels. The plexuses are best imaged in coronal and sagittal planes, but axial images give an idea about the nerve roots. Generally, T1 WI and T2 WI images are used in various planes for the imaging; but new sequences like MR Myelolography, Fiesta 3D and T2 cube are also used in addition to the basic sequences to gather more information to evaluate the anatomy more. The axillary artery and its branches. Nerves in the infraclavicular portion of the right brachial plexus in the axillary fossa. Cutaneous nerves of right upper extremity. Diagram of segmental distribution of the cutaneous nerves of the right upper extremity. The right sympathetic chain and its connections with the thoracic, abdominal, and pelvic plexuses. Spinal cord. Brachial plexus. Cerebrum.Inferior view.Deep dissection. In human anatomy, the arm is the part of the upper limb between the glenohumeral joint and the elbow joint. In common usage, the arm extends to the hand. It can be divided into the upper arm, which extends from the shoulder to the elbow, the forearm which extends from the elbow to the hand, and the hand. Anatomically the shoulder girdle with bones and corresponding muscles is by definition a part of the arm. The Latin term brachium may refer to either the arm as a whole or to the upper arm on its own. The radial nerve is a nerve in the human body that supplies the posterior portion of the upper limb. It innervates the medial and lateral heads of the triceps brachii muscle of the arm, as well as all 12 muscles in the posterior osteofascial compartment of the forearm and the associated joints and overlying skin. The axillary nerve or the circumflex nerve is a nerve of the human body, that originates from the brachial plexus at the level of the axilla (armpit) and carries nerve fibers from C5 and C6. The axillary nerve travels through the quadrangular space with the posterior circumflex humeral artery and vein. The phrenic nerve is a nerve that originates in the neck (C3-C5) and passes down between the lung and heart to reach the diaphragm. It is important for breathing, as it passes motor information to the diaphragm and receives sensory information from it. There are two phrenic nerves, a left and a right one. The long thoracic nerve supplies the serratus anterior muscle. This nerve characteristically arises from the anterior rami of three spinal nerve roots: the fifth, sixth, and seventh cervical nerves (C5-C7) although the root from C7 may be absent. The roots from C5 and C6 pierce through the scalenus medius, while the C7 root passes in front of the muscle. The suprascapular nerve is a nerve that arises from the brachial plexus. It is responsible for the innervation of some of the muscles that attach on the scapula, namely the supraspinatus and infraspinatus muscles. In medicine, a stinger, also called a burner or nerve pinch injury, is a neurological injury suffered by athletes, mostly in high-contact sports such as ice hockey, rugby, American football, and wrestling. The spine injury is characterized by a shooting or stinging pain that travels down one arm, followed by numbness and weakness. Many athletes in contact sports have suffered stingers, but they are often unreported to medical professionals. The subclavius is a small triangular muscle, placed between the clavicle and the first rib. Along with the pectoralis major and pectoralis minor muscles, the subclavius muscle makes up the anterior wall of the axilla. A brachial plexus injury (BPI), also known as brachial plexus lesion, is an injury to the brachial plexus, the network of nerves that conducts signals from the spinal cord to the shoulder, arm and hand. These nerves originate in the fifth, sixth, seventh and eighth cervical (C5–C8), and first thoracic (T1) spinal nerves, and innervate the muscles and skin of the chest, shoulder, arm and hand. The medial pectoral nerve arises from the medial cord of the brachial plexus and through it from the eighth cervical and first thoracic roots. The lateral pectoral nerve arises from the lateral cord of the brachial plexus, and through it from the fifth, sixth, and seventh cervical nerves. The nerve point of the neck, also known as Erb's point is a site at the upper trunk of the brachial plexus located 2–3 cm above the clavicle. It is named for Wilhelm Heinrich Erb. Taken together, there are six types of nerves that meet at this point. The ventral ramus is the anterior division of a spinal nerve. The ventral rami supply the antero-lateral parts of the trunk and the limbs. They are mainly larger than the dorsal rami. 1 2 Kawai, H; Kawabata, H (2000). Brachial Plexus Palsy. Singapore: World Scientific. pp. 6, 20. ISBN 9810231393. 1 2 3 4 Saladin, Kenneth (2015). Anatomy and Physiology (7 ed.). New York: McGraw Hill. pp. 489–491. ISBN 9789814646437. ↑ Goel, Shivi; Rustagi, SM; Kumar, A; Mehta, V; Suri, RK (Mar 13, 2014). "Multiple unilateral variations in medial and lateral cords of brachial plexus and their branches". Anatomy & Cell Biology. 47 (1): 77–80. doi:10.5115/acb.2014.47.1.77. PMC 3968270 . PMID 24693486. ↑ Moore, K.L. ; Agur, A.M. (2007). Essential Clinical Anatomy (3rd ed.). Baltimore: Lippincott Williams & Wilkins. pp. 430–1. ISBN 978-0-7817-6274-8. ↑ Saladin, Kenneth (2007). Anatomy and Physiology: The Unity of Form and Function. New York, NY: McGraw-Hill. p. 491. ISBN 9789814646437. ↑ "Axillary Brachial Plexus Block". www.nysora.com. New York School of Regional Anesthesia. 2013-09-20. ↑ Moore, K.L. ; Agur, A.M. (2007). Essential Clinical Anatomy (3rd ed.). Baltimore: Lippincott Williams & Wilkins. pp. 434–5. ISBN 978-0-7817-6274-8. 1 2 Ecker, Jeffrey L.; Greenberg, James A.; Norwitz, Errol R.; Nadel, Allan S.; Repke, John T. (1997). "Birth Weight as a Predictor of Brachial Plexus Injury". Obstetrics & Gynecology. 89 (5): 643–47. doi:10.1016/S0029-7844(97)00007-0. PMID 9166293. ↑ Moore, Keith (2006). Clinically Oriented Anatomy. Philadelphia: Lippincott Williams & Wilkins. pp. 778–81. ISBN 0-7817-3639-0. ↑ Cooper, DE; Jenkins, RS; Bready, L; Rockwood Jr, CA (1988). "The prevention of injuries of the brachial plexus secondary to malposition of the patient during surgery". Clinical Orthopaedics and Related Research (228): 33–41. doi:10.1097/00003086-198803000-00005. PMID 3342585. ↑ Jeyaseelan, L.; Singh, V. K.; Ghosh, S.; Sinisi, M.; Fox, M. (2013). "Iatropathic brachial plexus injury: A complication of delayed fixation of clavicle fractures". The Bone & Joint Journal. 95-B (1): 106–10. doi:10.1302/0301-620X.95B1.29625. PMID 23307682. ↑ Midha, Rajiv (1997). "Epidemiology of Brachial Plexus Injuries in a Multitrauma Population". Neurosurgery. 40 (6): 1182–8, discussion 1188–9. doi:10.1097/00006123-199706000-00014. PMID 9179891. ↑ "Brachial Plexus Injuries Information Page: National Institute of Neurological Disorders and Stroke (NINDS)". www.ninds.nih.gov. Retrieved 2016-11-28. ↑ Doumouchtsis, Stergios K.; Arulkumaran, Sabaratnam (2009-09-01). "Are all brachial plexus injuries caused by shoulder dystocia?". Obstetrical & Gynecological Survey. 64 (9): 615–623. doi:10.1097/OGX.0b013e3181b27a3a. ISSN 1533-9866. PMID 19691859. Saladin, Kenneth (2014). Anatomy and Physiology (7th ed.). McGraw-Hill Education. p. 491. Kishner, Stephen. "Brachial Plexus Anatomy". Medscape. WebMD. Retrieved 29 Nov 2015. Wikimedia Commons has media related to Brachial plexus . Learn the Brachial Plexus in Five Minutes or Less by Daniel S. Romm, M.D. and Dennis A. Chu Chu, M.D.